Fairies have been held in high esteem in folklore for many, many years, but have you ever thought about where they reside? Maine holds within it such beauty and enjoyment with many places to explore. It seems to be wonderfully endless. Whether it be the coast, the lakes, the mountains, or the woods I am regularly surprised at what I might find when I am trekking along and exploring. A number of years ago I stumbled up a very intriguing and mystical world while hiking along the Cliff Trail in Harpswell, Maine. Part way down the path a sign declared that a Fairy Village lay ahead. Fairy Village? I was not certain what I would find, but believed that it would likely bring a smile to my face. I wasn’t on the trail long when I discovered the village and indeed, a smile ensued. As a child, I believed that fairies were invisible and never really thought about where they might live. I never imagined that as an adult I would learn so much about what seemed like a childhood fascination. Houses are made so that fairies will have a place to be, to visit or even live if they wish. With fairies in mind, they are created by children and adults alike in hopes that their creation will be enjoyed by the elusive and mysterious beings. Whether part of a village or a sole dwelling, they are often nestled amongst trees and gardens. Some basic rules apply when deciding what to use in the creation of the house. Use natural materials such as twigs, leaves, rocks, pine cones, acorns, dried flowers and grass, and other natural items from the area. When near the coast items such as shells and seaweed are often incorporated. Live plants should not be used, but rather respected and left to nature and enjoyment for the fairies. Typically, there is door or entry for the fairy to enter and exit. Otherwise, the options and styles are endless. There may be a roof or the house may be open to the sky. It may be built into the ground or perhaps integrated into a tree. A pathway may lead to the entryway, or one might need to search to find a secret passage into the house. They might be purely simple in style or elaborate with many features. One can often spot a bit of furniture or treasures left inside. 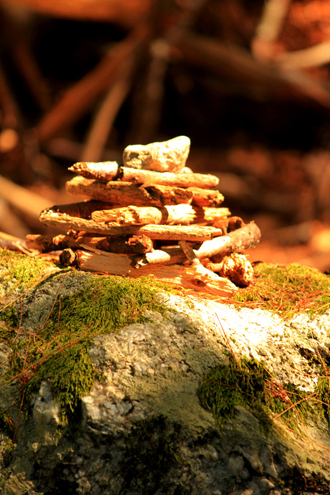 Some dwellings are so much a part of the natural environment that they may be hard to see. Along with the affects of the weather, a variety of creators leads to an evolving and dynamic world for the fairies to enjoy. Some Houses are even Furnished! As I shared my discovery with others, I learned that a village was present on Mackworth Island in Falmouth, Maine, very close to where I lived. I definitely needed to make a visit. After arriving at the island, I began walking along the path that would take me to the Fairy Village. As I walked and looked, I found myself becoming excited and intrigued about what I would find. I had heard it was a large community, but how big would it be? The answer? Big! Outside the village proper, there were little suburbs with clusters of houses or a lone small dwelling here and there. The village itself was bordered by a rustic fence and gate. Inside as far as I could see straight ahead, to the left and right were houses. 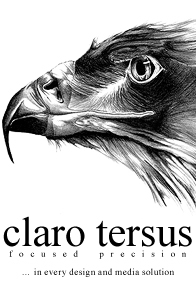 Big, small, new, old, elaborate, simple. So many. I couldn’t wait to explore beyond the gate and capture the wonderful creations with my camera. Would I see a fairy amongst this mystical land? Or would they be as elusive as they had been when I was a child. 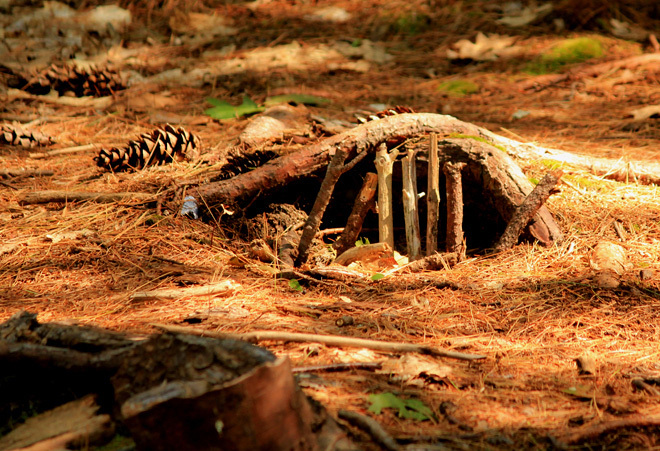 Fairy House villages have popped up in New England in recent years. In Maine, they can be enjoyed in Harpswell, Boothbay and on Monhegan and Mackworth Islands. Portsmouth, New Hampshire and Grafton, Vermont also host villages. Festivals and events are on the rise throughout the New England states and are enjoyed by children, as well as adults. One day, I hope to catch sight of a fairy out of the corner of my eye while I am visiting one of the villages or enjoying a festival. Perhaps you will, too. 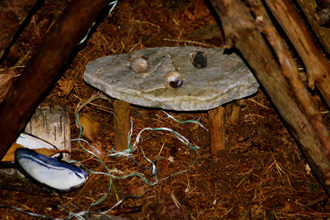 See more of Judy's wonderful photos of the Fairy Houses in our slideshow.